“There is no amount of regulation that can overcome human error,” said Alberta’s Energy Resources Conservation Board (ERCB) spokesman Darin Barter. ERCB released an investigation report that cites inadequate management of risks as one of the main causes of a September 2011 accident that contaminated groundwater with toxic hydraulic fracturing chemicals, including the cancer causing agent known as BTEX (benzene, toulene, ethylbenzene, and xylene). The incident occurred near Grande Prairie in northern Alberta when Crew Energy and GasFrac Energy Services workers failed to “recognize and properly assess a number of issues that led to the perforation and fracturing above the base of groundwater protection,” according to the report. Workers accidentally fracked directly into an underground water table after a series of mishandled errors resulted in a massively bungled frack job that injected 42 cubic metres of unrecoverable propane gel into an aquifer some 136 metres below ground. Some of the major incidents involving water contamination – such as the high-profile water contamination case in Pavillion, Wyoming – are related to shallow gas wells, where cement barriers are unable to isolate frack fluids from water-bearing zones, or geological barriers (i.e. rock beds) are insufficient to prevent contaminant migration. In this particular incident operators botched a frack job at roughly 136 metres below surface level, even though the base of groundwater protection was at a depth of 600 metres. No fines will be levied at the companies responsible for the water contamination. Hydraulic fracturing involves injecting fluids under pressure into underground rock formations to cause cracks to release natural gas or oil. More than 42 cubic metres of propane used by Crew in its fracking process couldn’t be recovered and remains underground. The ERCB required Crew to develop and implement a detailed plan to prevent similar incidents occurring again. Crew must also provide to the ERCB the analysis from groundwater monitoring Alberta Environment is conducting on site. In its own documents to address public concerns on the threats to groundwater, the ERCB states it “has regulations that strictly limit the depth of shallow fracturing, distances to water wells, limit the fracture volumes that can be used and specify the use of non-toxic fracture fluids to ensure groundwater protection.” Inadvertent or not, Crew violated the regulations. However, its marching orders largely amount to working to ensure it doesn’t happen again. Alberta Environment said monitoring indicates only the lower aquifer, which is not used for water supply, was contaminated with propane and other toxins but a shallower aquifer that’s used for some wells in the sparsely populated area wasn’t affected. Neither the ERCB nor Alberta Environment intends to fine Crew or GasFrac. Last week, the ERCB concluded a well blowout near Innisfail last January that spewed 500 barrels of oily liquid over a field was caused by a company fracking a nearby well. It said “communication” between a well fracked by Midway Energy and a nearby well operated by Wild Stream Exploration caused the blowout. 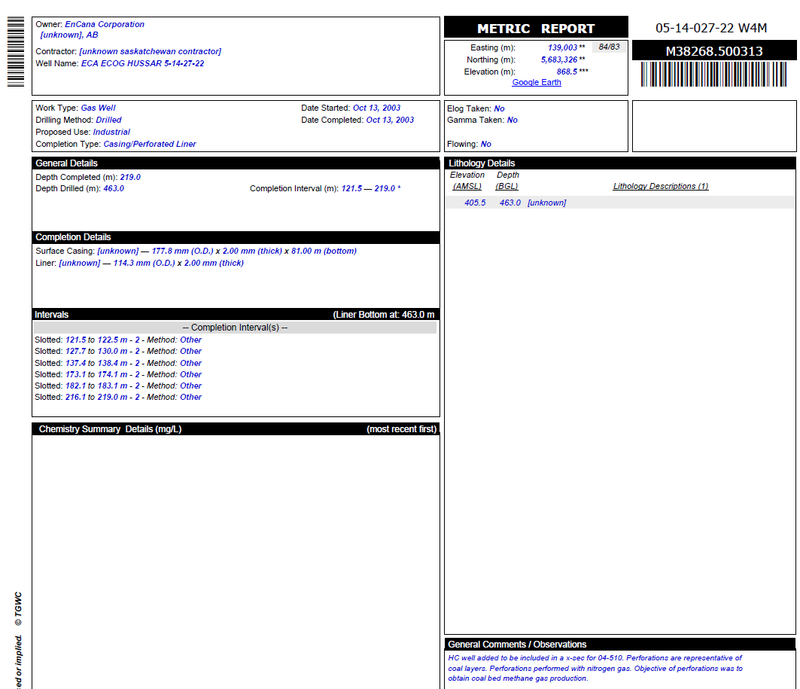 No enforcement order was issued because the action didn’t violate regulations in place at the time. Leaked fracking fluid has contaminated groundwater after a “serious” incident at a well site near Grande Prairie in September 2011, according to an investigation by the Energy Resources Conservation Board which regulates the energy industry. Calgary-based Crew Energy “inadvertently” released toxic fluids at too shallow a level in a natural gas well and then failed to realize the leak was occurring underground, said the ERCB report released Thursday. The Energy Resources Conservation Board (ERCB) is in the process of a large-scale review of its fracking regulations, with changes implemented sometime in 2013. The ERCB is specifically concerned with water aquifer protection, preventing above-ground chemical spills, and interwellbore communication. “That’s when you have two oil or gas wells that are close enough down-hole that there is some sort of impact on one due to activities in the other well,” explains ERCB spokesperson Bob Curran. That kind of underground communication between Midway Energy’s fracking operation and a nearby well operated by Wild Stream Exploration caused a blowout near Innisfail last January. At their closest point, those two wells are 129 metres apart. When the pressure that built up in one escaped to the other bore-hole, fracking fluid leaked to the surface. Curran says that since the ERCB began monitoring interwellbore communication this year, there have been 21 incidents, but they rarely cause damage. … Curran says geologists understand the technology and its potential consequences quite well, and that the ERCB is not struggling to align rule-changes with a poorly developed science. “Hydraulic fracturing as a technology is very well understood, and it’s been applied here extensively in Alberta over our history…. There’s been over 171,000 wells that have been hydraulically fractured in Alberta since the practice began in the 1950s,” he says. Curran says it’s this understanding of the technology, Alberta’s geology, and a long-standing “stringent” regulatory system that have prevented negative incidents in Alberta that are making headlines in other parts of the continent. While the ERCB is confident in the safety of fracking, the matter is still up for debate elsewhere. Dr. David Layzell, the head of the University of Calgary’s Institute for Sustainable Energy, Environment and Economy, says there are significant questions about the technology. “We do not have good peer-reviewed data from controlled experiments on the costs, benefit and trade-offs (environmental, economic, risk) of the various fracturing technologies. We also need independent, arm’s-length analysis of the greenhouse gas emissions (especially methane) that typically occur during the fracturing process. Some studies have suggested that these emissions can be quite high, while others provide data suggesting that the emissions are insignificant. Most of the evidence to date suggests that there are few environmental impacts associated with the fracturing itself. The problems that have arisen seem to come from spills at the surface, poor integrity of the well casing, or re-injection/disposal of the spent fracturing fluids creating small seismic events,” Layzell explains by email. He calls on the U.S. National Academy of Sciences, Royal Society of Canada, and Canadian Council of Academies to take the lead in designing and carrying out studies in order to avoid conflict of interest and other issues that have arisen from industry and university-led research. It’s not that studies haven’t been conducted — many have — but contradictory findings and questionable research practices have led many of them to cancel each other out. In February 2012, Layzell participated in a panel discussion at the American Association for the Advancement of Science conference in Vancouver on fracking’s effect on water quality. The research that discussion was based on was a highly publicized University of Texas study that found no link between fracking and water contamination. The paper suggested public anxiety over fracking was based on biased media reports rather than scientific evidence, and concluded regulatory regimes need not be changed. In the following months, the University of Texas discovered the lead researcher, Dr. Chip Groat, sat on the board of a fracking company while authoring the paper. A subsequent university review declared “the design, management, review and release of the study… fell short of contemporary standards for scientific work,” and that the study was “inappropriately selective in the use of material.” Ironically, that study was originally supposed to be funded by an oil company, but funding was rejected when the company insisted it be allowed to vet the final report. 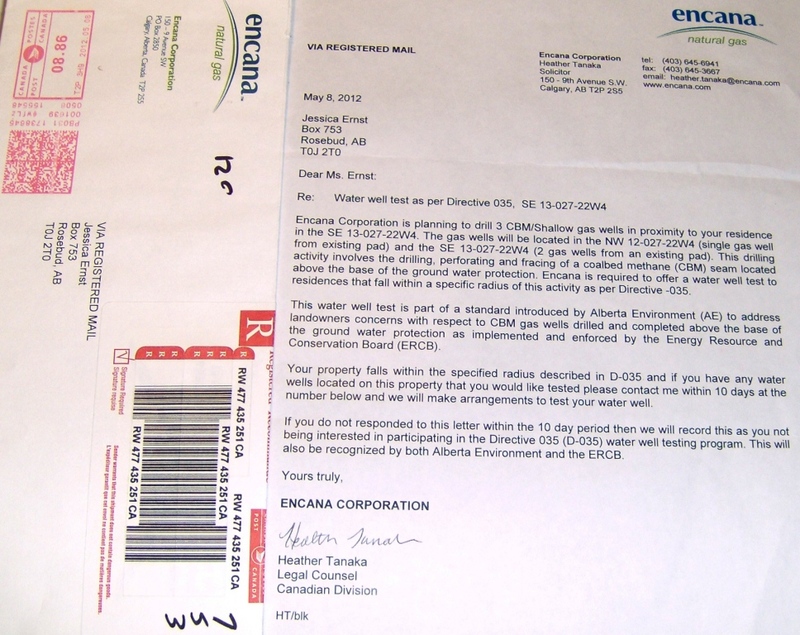 Leaked fracking fluid has contaminated groundwater after a “serious” incident at a well site near Grande Prairie in September 2011, according to an investigation by the Energy Resources Conservation Board which regulates the energy industry. Calgary-based Crew Energy “inadvertently” released toxic fluids at too shallow a level in a natural gas well and then failed to realize the leak was occurring underground, said the ERCB report released Thursday. “There were multiple opportunities to recognize that a problem existed which could have prevented or at least minimized the impact of hydraulic fracturing operation above the base of groundwater protection,” says the report. While a drinking water source near the surface was not affected, a groundwater basin below it was contaminated, said ERCB spokesman Daren Barter, adding this is considered a “serious” if rare incident. The ERCB gave the company a “high risk enforcement action” ordering it to supply a revised fracking plan. … Only non-toxic fluids can be used above the base of groundwater. The level is set for each region by Alberta Environment. About 40 cubic metres of the propane gel injected underground remains there, so no drilling is allowed in a 200-metre radius of the well site. Alberta Environment tested the contaminated water this fall and found chemicals from fracking fluid, including benzene, toluene, ethylbenzene and chloride. A sandstone layer separates the two water sources so the risk to drinking water was deemed “insignificant,” says Alberta Environment. Alberta Environment will continue to monitor the contaminated water “for some time” to make sure the toxic fluids do not migrate or spread underground, said department spokesperson Jessica Potter. If that happened, “we would have to deal with it,” she added. – Failure to recognize and properly assess a number of issues that led to the perforation and fracturing above the base of groundwater protection. As a result of enforcement action being taken, the ERCB required the company to develop and implement a corrective action plan that details measures to prevent similar incidents from occurring in the future. The ERCB is currently auditing the company’s action plan. Additionally, Crew is required to provide all analysis from its Alberta Environment and Sustainable Resource Development directed groundwater monitoring program to the ERCB. Incidents of this nature are very rare. More than 171,000 oil and gas wells have been hydraulically fractured in Alberta since the 1950s. In recent years, more than 4,000 multi-stage hydraulic fracturing operations have been conducted in Alberta. … The company is now required to conduct ongoing groundwater monitoring in the area and to develop and implement a plan that details measures to prevent similar incidents. 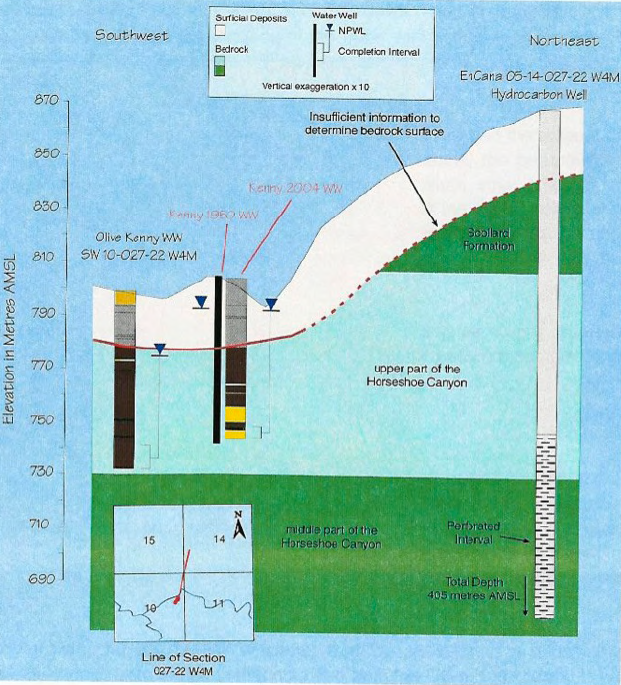 On September 22, 2011, Crew Energy Inc. (Crew) was performing a hydraulic fracturing operation on the Caltex HZ ELM 11-34-068-10W6M (actual bottomhole location) well and inadvertently perforated above the base of groundwater protection at a depth of 136 metres measured depth (mMD). 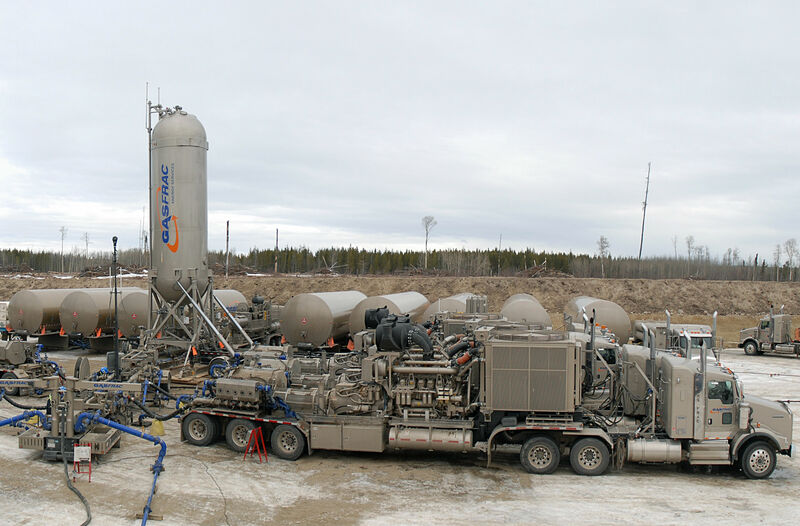 Hydraulic fracturing operations were subsequently conducted using gelled propane as a carrier fluid, pumping 20.07 tonnes of sand and 130 cubic metres (m3) of gelled propane. When it was realized that hydraulic fracturing had occurred through the shallow perforations, flow-back operations of the fractured interval were conducted. A two-well groundwater monitoring program was initiated and is ongoing to evaluate the impact of the incident upon groundwater. The monitoring wells are located approximately 50 metres (m) northeast of the surface location of the hydraulically fractured well located at LSD 16-27-068-10W6M. This location was recommended by Crew and accepted by Alberta Environment and Sustainable Resource Development (ESRD) based on the hydraulic gradient and expected aqueous transport direction. • The well was filled with fluid to circulate out debris. • The perforating gun was run in on coil and the well was perforated. • The coiled tubing collapsed. • Coiled tubing was re-run in and the well was blown dry with nitrogen. • The bridge plug was set but the casing failed a pressure test. • Well continued to flow. • Squeezed cement plug into the perforations at 136 mMD. Crew findings are largely captured in Appendix A: Crew Energy Root Cause Analysis and supplemented with information provided throughout the investigation. • a follow-up meeting with Crew and the ERCB on February 23, 2012, to allow Crew to provide the ERCB with their plans to better manage the risk with future high vapour pressure (HVP) hydraulic fracturing operations. Debris in the wellbore following an earlier stage of the fracturing operation at a depth of 1650 mMD caused the running of a bridge plug to not reach the planned setting depth. The debris resulted in the addition of the step to circulate the well with potassium chloride (KCl) water to remove the debris from the well. As a consequence, the well was left fluid filled rather than gas filled as called for in the completions program. A program deviation necessitated the well be circulated to water prior to perforating. At approximately 137 m, the depth where the perforations were found, the coiled tubing jumped on the reel while stripping in. This was interpreted to be a coil wrap problem on the coiled tubing reel. The possibility that the perforating gun had fired at this depth was not recognized at the time. The jump of the coiled tubing at 137 mMD was interpreted by Crew personnel as being a loose wrap on the coiled tubing reel. The coil jump at 137 mMD is the first evidence of off-depth perforations. The possibility that the perforating gun had fired at this depth while running in was not considered at this point. The perforating gun was run to the planned depth of 1486 mMD and pressured up to perforate the well. The firing head was shear-pin-pressure activated and set to fire at 27 330 kPa. The observed pressure was 17 000 kPa, more than 10 000 kPa below the design pressure. This difference was not acknowledged as being a significant deviation, nor was it recognized as an indicator that the well might not have been perforated at the planned depth. The service company providing the perforating service interpreted the 17 000 kPa as the perforating guns having fired at depth. During the Crew investigation, the service company stated this pressure was normal. Testing of an identical firing head by the manufacturer demonstrated the head should have fired within 5% of the design pressure (26 000 to 28 700 kPa). The long-term instrumentation, monitoring, and sampling program for the site is pending based on the results of the pumping tests and ESRD’s approval. Combustible gas was detected through lower explosive limit (LEL) measurement at the surface during the pumping and water sampling tests in the deeper monitoring well Crew was required to report the detection of combustible gas to the ERCB. In addition to the routine components, the deeper monitoring well is likely to continue to be tested for isopropanolamine, being the selected indicating chemical for the presence of the fracturing fluids. The sampling event in February 2012 detected the presence of isopropanolamine in a sample collected from the deeper well; however, isopropanolamine was not detected in either monitoring well in the samples collected on September 20, 2012. 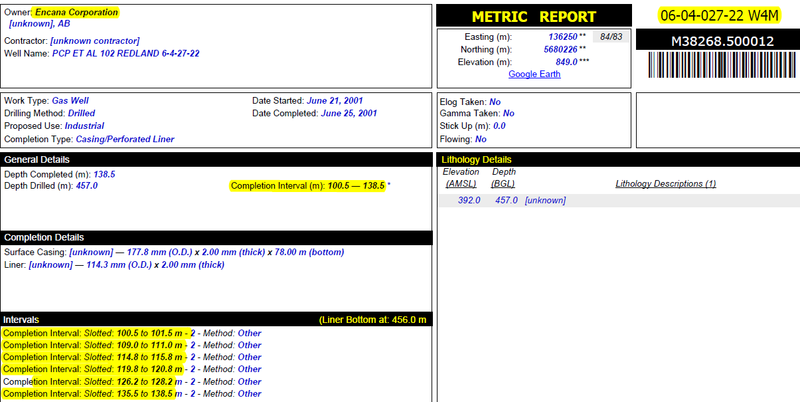 The total Kjeldahl nitrogen (TKN) and ammonia concentrations both showed a significant decrease to one-fifth of the previous concentrations, possibly indicating the attenuation of the amines as well. The groundwater composition on September 20, 2012, continued to be impacted by the fracturing fluids. The concentrations of chloride has decreased from the February 2012 sample, but remains elevated. Benzene, toluene, ethylbenzene, and xylene (BTEX) concentrations remained unchanged between the February and September 2012 sampling events. The petroleum hydrocarbon (PHC) fractions F2 through F4 concentrations overall decreased (with the PHC fraction F1 showing an anomalous increase). An increase in iron concentrations and a decrease in nitrate concentrations between February and September 2012 is potentially due to the biodegradation of the hydrocarbons as conditions become more anaerobic. A significant increase is noted in the concentrations of dissolved organic carbon (DOC) and phosphorous, potentially related to biological activity. Fears only ‘theoretical’ says Energy Resource Conservation Board member … Freeman said, “The chemicals injected into the ground are no worse than using fertilizer…or by cleaning your coffee machine with CLR.” … “I don’t think there have been any incidents in Alberta where fracking has adversely affected a water table…,” McManus [vice chair of the Energy Resource Conservation Board in Alberta] said. 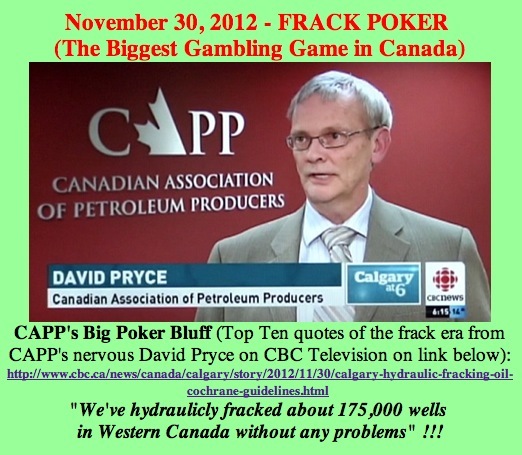 URF: What are the impacts on water by the ERCB, Spring 2012 There has not been a documented case of direct contamination due to hydraulic fracturing in Alberta. 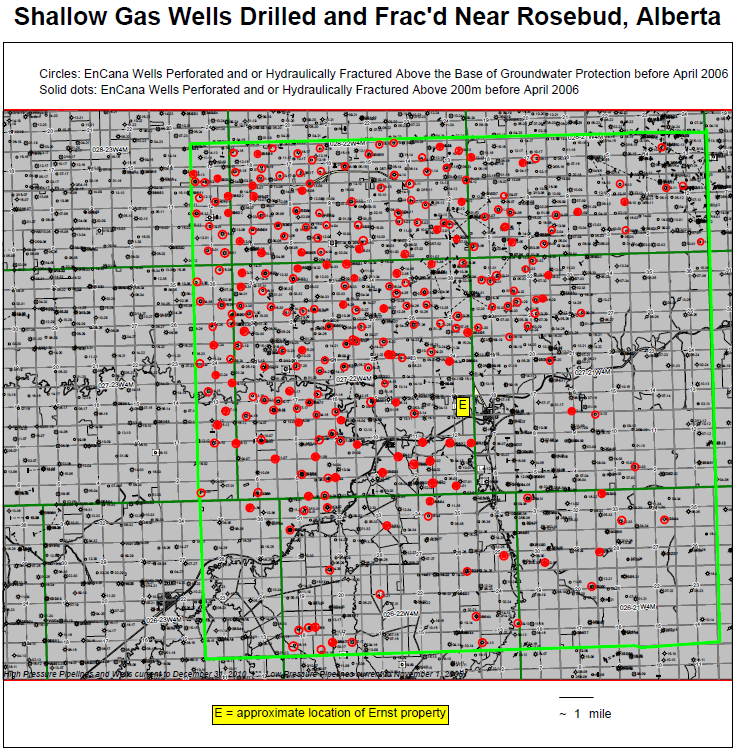 EnCana’s intentional perfs and fracs Above the Base of Groundwater Protection at Rosebud, Alberta – before April 2006, many more wells continue to be intentionally perforated and frac’d Above the Base of Groundwater Protection within the map area and beyond. Slide from: Is hydraulic fracturing safe and sustainable? Presentation by Jessica Ernst on May 3, 2011 in New York at the United Nations 19th Commission on Sustainable Development. Click to get PDF, zoom in for legal land descriptions. Black are deeper energy wells.